I love hanging collections - my three favorites are clocks, mirrors, and plates. You can obviously mix any of those three together and with picture frames as well if you like. I got all but one of these clocks at Hobby Lobby (which means I got them all half off as well- which I love). I also got the gold letters to make the roman numeral 12 at hobby lobby. They have larger letters there too but unfortunately don't have a large X. 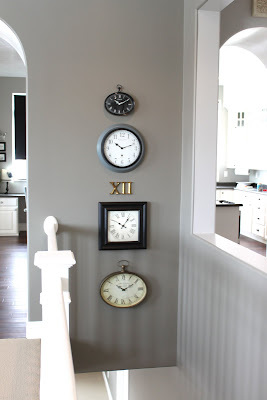 It got me to thinking what cute wall decor roman numerals could make anywhere in your house - you could do the roman numeral for your address, the year your family was established, number of people in your family, etc. Unfortunately roman numerals can get quite long - you can find a roman numeral converter online to check what different numbers would be. I stole the mirror collection idea from my sister Angela. She has a large wall in her foyer covered in different mirrors and it is beautiful. 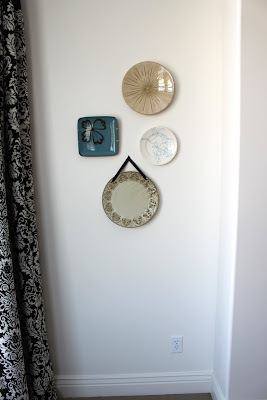 I didn't have a big space to do a large mirror collection but I think even 6 small ones look pretty cute. It took some time to find some I liked so I was happy to realize I could use picture frames too. The center two are picture frames, I removed the glass then had a glass company cut mirror for me that would fit in the frame. 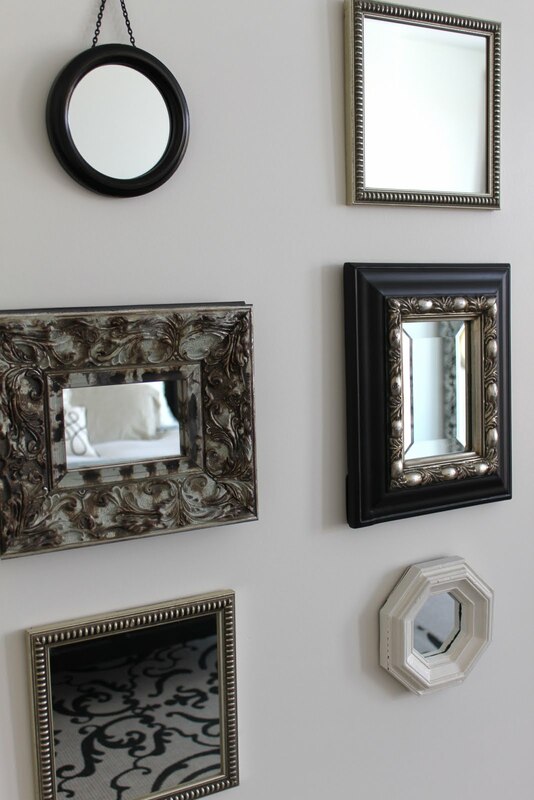 You can also find plain mirrors in some sizes like 4x6 and 8x10 at craft stores. Pier 1 Imports is my favorite place to find cute plates. I bought more than I needed then brought them home to arrange them and then took back what I didn't need. The one plate I couldn't find and felt the collection needed was a white plate with blue on it so I actually made that one at Color me Mine. It is a really fun pottery place where you design and paint anything you want onto plates, platters, pitchers, etc. then they fire it for you. I've made personalized plates for some family members there as well - they make great gifts! Now I just need paint behind my mirrors and plates - they don't look great on white walls!